Vishalakshi has over fifteen years’ experience in the creative and cultural sector and in that time has managed and delivered over 250 projects. She founded Earthen Lamp in 2011 to provide intelligence and bright thinking for the creative and cultural sectors. She has a PhD in Entrepreneurship from Warwick Business School and her research focused on Identity Work of Nascent Creative Entrepreneurs. Vishalakshi has a background in accounting, advertising and market research, holds a Master’s degree in Creative and Media Enterprises, and a Postgraduate Diploma in Advertising and PR. 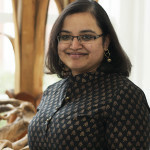 Since 2009, Vishalakshi has been using her industry expertise to teach audience development and strategic planning to masters students at The Centre for Cultural Policy and Media Studies, University of Warwick. Vishalakshi is a Certified Member of the Market Research Society, and a member of the Institute of Small Business and Entrepreneurship . She is a Director of Live and Local and Creative Academies Network.